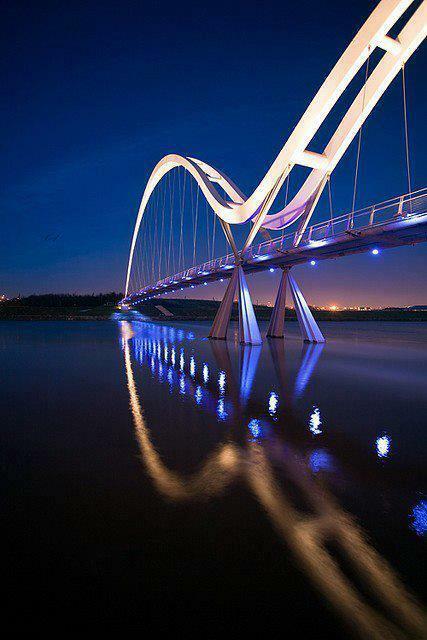 The Infinity Bridge is a public pedestrian and cycle footbridge across the River Tees in the borough of Stockton-on-Tees in the north east of England. The bridge is situated one kilometre downriver of Stockton town centre, between the Princess of Wales Bridge and the Tees Barrage and it links the Teesdale Business Park and the University of Durham's Queen's Campus in Thornaby-on-Tees on the south bank of the Tees with the Tees Valley Regeneration's £320 million North Shore development on the north bank. Built at a cost of £15 million with funding from Stockton Borough Council, English Partnerships and its successor body the Homes and Communities Agency, One NorthEast, and the European Regional Development Fund the bridge is a major part of the North Shore Redevelopment Project undertaken by Tees Valley Regeneration.